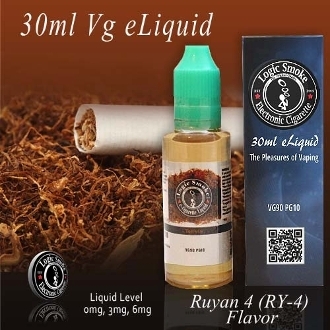 If you like to vape in tobacco flavors, but don't necessarily have an appreciation for some of the bolder, stronger tobacco flavors, then Logic Smoke RY4 is just for you! This beautifully smooth and mellow tobacco flavor has subtly sweet caramel undertones with just a hint of vanilla. It's truly a vaping experience you can't pass up. The aroma is as stunning as it's flavor. When you vape this special VG/PG blend, made especially for your favorite MOD unit, you won't believe the big, wonderful clouds of aromatic vapor you'll experience. It's a definite must try! !